Over 1 billion people worldwide live with some kind of disability. As a company built on inclusion, Accessibility is more than just a slogan or trend for Oath, but a belief in dignity. It’s how we show respect for the basic human needs to be seen and heard, to be welcomed and included, and to enjoy equal access to the world we’re helping to create. We are committed to delivering an excellent experience for our users with disabilities. Here’s how we do it. See how our work in advocacy and education helps to push standards in the industry and in society. Our team works to build a culture of accessibility inside Oath through education, experiences, and connection to our communities. Interested in what we do or helping us do it? We’re ready to hear from you. Verizon, the National Disability Leadership Alliance and Getty Images showcase the first images from The Disability Collection at the Verizon Technology & Policy Center in Washington D.C.
Oath won a Shorty Social Good Award for its landmark partnership with the National Disability Leadership Alliance and Getty Images to change the representation of disability in the media. 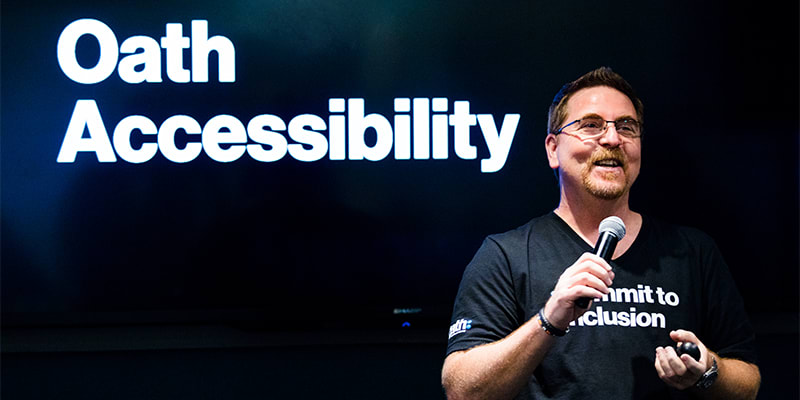 Mike Shebanek is a man on a mission to make technology accessible for all. We caught up with him in our Sunnyvale Accessibility Lab to talk about the Americans with Disabilities Act. Stiamo aggiornando il nostro nome, rimanendo concentrati sulla creazione dei contenuti, dell'advertising e delle tecnologie di domani.